30404 Friendship Flower had a very short window of availability on Valentine's Day but it's making a quick comeback for Mother's Day as a free offering with any purchase over £15 in store, certainly in the UK at least. I'll update on other territories as news comes in. I was able to grab one a couple of weeks back, and while I'd not be one to usually love a Friends set, this doesn't fit the mould at all, so I thought I'd post a mini review. 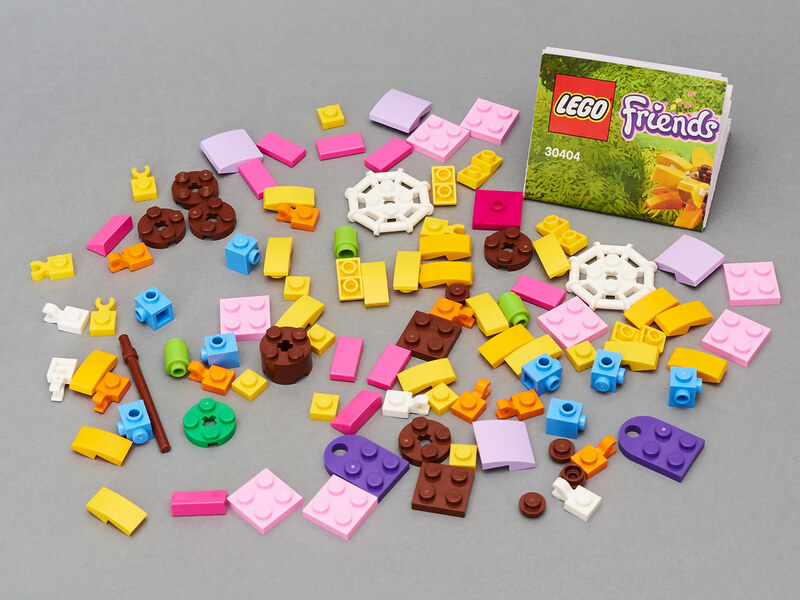 It's a wonderfully coloured polybag, and while the colour palette of the build is perfect for Friends this could so easily have been released as a Creator themed poly, give or take the heart. Inside there is a veritable smorgasbord of pieces to behold plus the instruction sheet – just check out all of the colours. There's some interesting parts too like the 26604 (Brick 1X1, W/ 2 Knobs,) in Medium Blue. I had 9 minutes build time, and these are the core elements of it all. 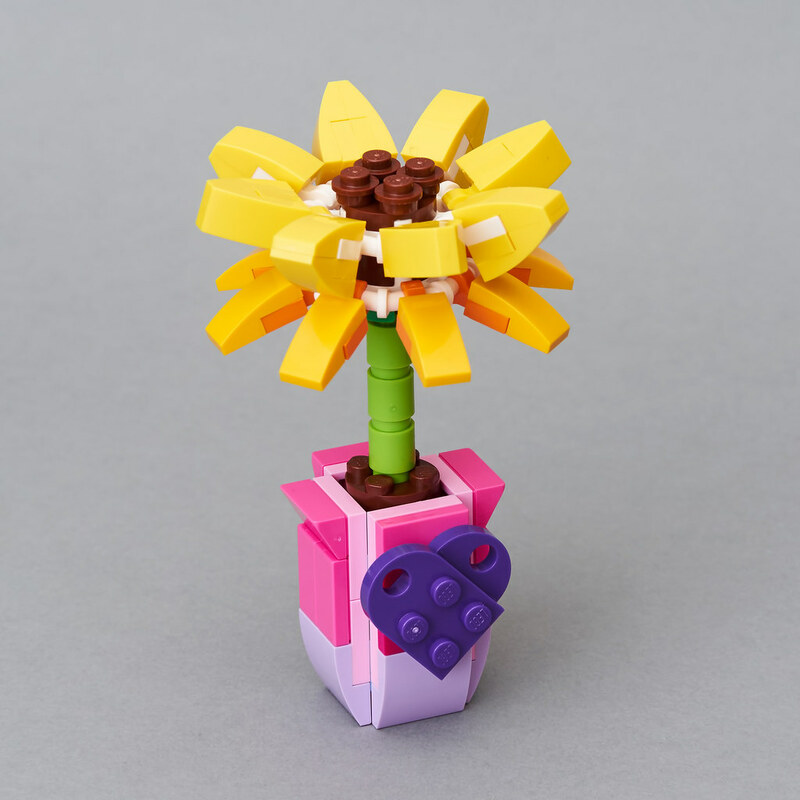 The petals are a bit fiddly and proved one of the things that I spent a bit of time getting lined up to my satisfaction, but considering it's just a little Friends polybag, the techniques in the build are interesting. In it's finished form it looks superb. In fact I think it looks better than the comparable daisy in 40187 Flower Display. Certainly it makes a perfect partner set. The difference from the back is merely the lack of a heart. 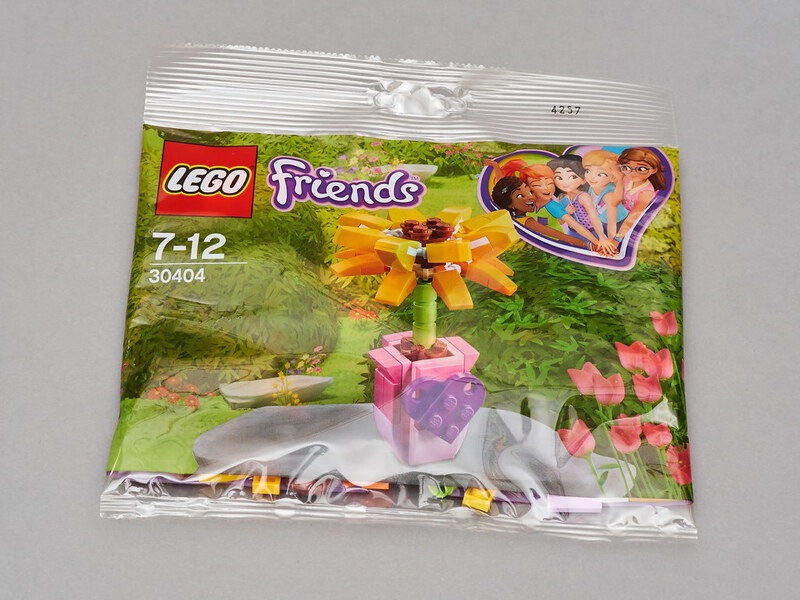 Hopefully this polybag will become widely available for purchase soon enough. For the moment, we'll have to put up with it being a freebie – and free stuff is always welcome. There's really nothing not to like about it at all and it's definitely one of the better giveaways I've seen. I'll probably MOC another in alternative colours to complement it. Grab one if you can. Got this today from the LEGO store in Glasgow. Neat little build. Bought the UCS Hulkbuster and they surprisingly still included both art prints, the marvel polybag, the flower, easter freebie and year of the dog! This is available for purchase at Walmart in Canada. This is cute and colourful my daughters will want one each.. I love it but haven't got a spare £15 to get it 'free'. Shame I can't just buy it like the other flower set. It's available in the US at Toys R Us. $3.99 at Toys r Us in the US. Only available in store. A life-size accessory like this is out of the ordinary for a Friends polybag (let alone a polybag for most story themes), but I'm down with it. I'd love something like an Elves polybag with a buildable version of Emily's amulet, or perhaps a Ninjago polybag with buildable shurikens! It's a really nice polybag and parts pack too. @James_Arkham I'm not surprised the Hulkbuster promo items were still available from the Glasgow store. The weather at the weekend, when the promo was on, whilst an improvement over Wed, Thu, Fri, was still pretty bad. I never got this e-mailshot :o[ I wonder why not? Thanks to iso3200 for the review and the heads up about the return of this freebie. @Lyichir: A buildable amulet polybag would be epic, but I think LEGO prefers to avoid life-size brick-built weapons out of fear of kids hitting each other with them. The only ones I can remember them making are brick-built lightsaber handles (without blades) as alternate builds for some old Star Wars sets. And I guess some weapon-shaped vehicles in Nexo Knights. But usually for weapon-related play LEGO seems to prefer sticking with either miniaturized weapons or play-safe foam weapons. 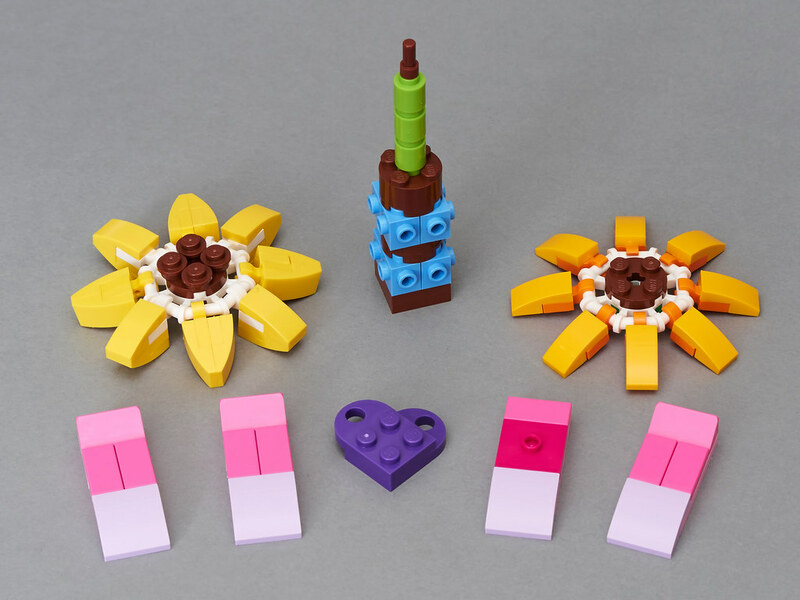 Anyway, this set is really cute and surprisingly complex compared to some of the other flower sets LEGO has released in the past! 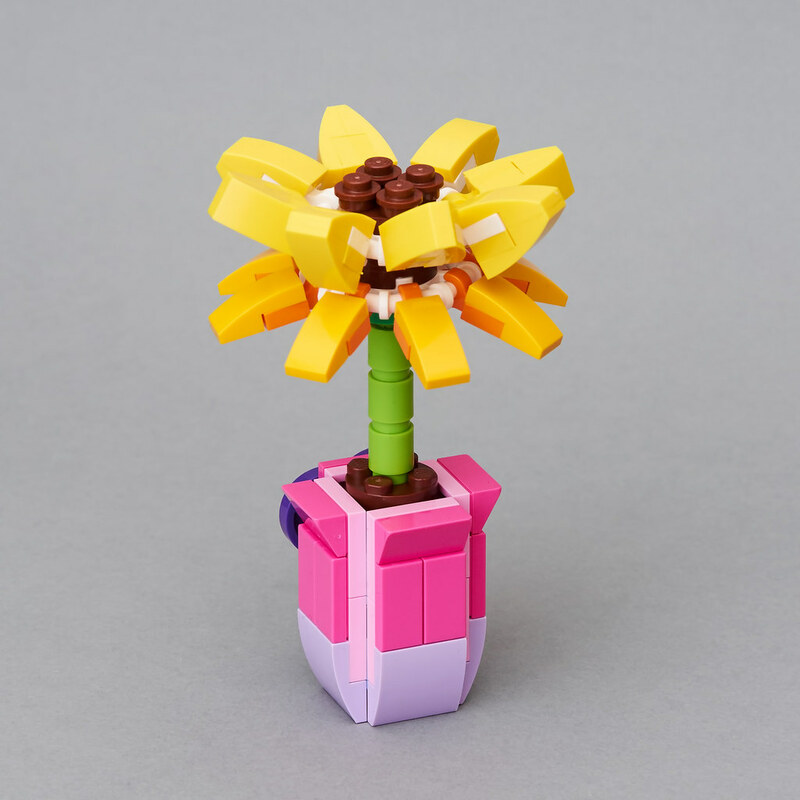 It's really awesome that the petals on the top level aren't all built the same way. It's also a great source for some of those curved slopes. When to get one of these on Mother’s Day only to find all local stores out of stock. Maybe it is reaction to last year’s over production. May think twice before I part with the £13.50 for the train fare. I found this at my local Toys "R" Us store last night, along with 6 different polybags.